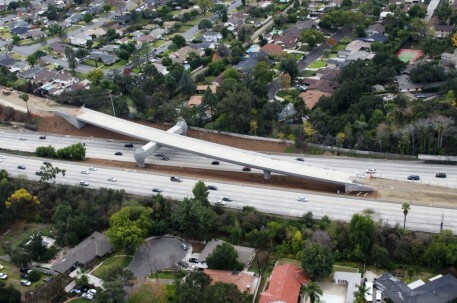 Completed on-time and on-budget in December 2012, the Gold Line Bridge is a 584-linear-foot bridge stretching diagonally across the Eastbound I-210 Freeway in Arcadia, California. 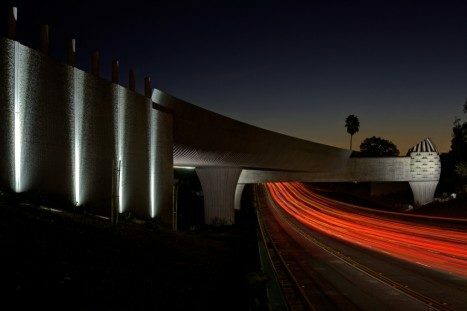 The $18.6 million dual track bridge is the first element of the 11.5-mile Foothill Gold Line light rail project from Pasadena to Azusa to be completed, providing connection between the existing Sierra Madre Villa Station in the city of Pasadena and the future Arcadia Station. 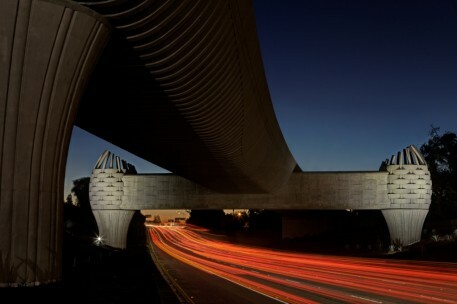 The Construction Authority, with the help of award-winning public artist Andrew Leicester, envisioned the Gold Line Bridge as a memorable expression of the community, past and present. Mr. Leicester was selected through a competitive national call process which the Construction Authority initiated in 2009. 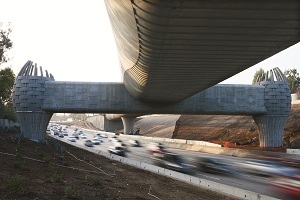 The Construction Authority hired Mr. Leicester as the Design Concept Advisor before the contractor and architect, re-imagining the design process for infrastructure projects. 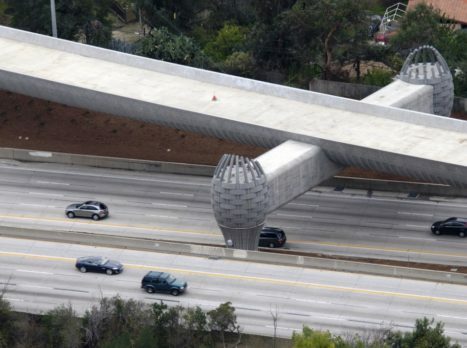 This ground-breaking collaboration resulted in the creation of a sculptural bridge, which could be built for the same cost as was originally estimated for a typical structure of its make-up. 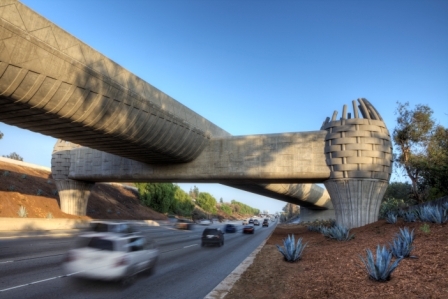 The Gold Line Bridge design concept was developed by award-winning public artist, Andrew Leicester who has completed several large scale public art works throughout the United States. 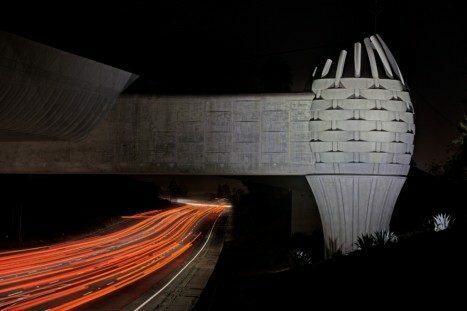 His bridge design was inspired by the local indigenous peoples and wildlife, as well as the roadside attractions of Route 66 with its oversized architectural landmarks. These inspirations permeate all elements of the structure. Most notable are the two 25-foot tall, 17-foot diameter sculptural baskets flanking the sides of the main superstructure, tied together visually by the relief-pattern on the outrigger beam. 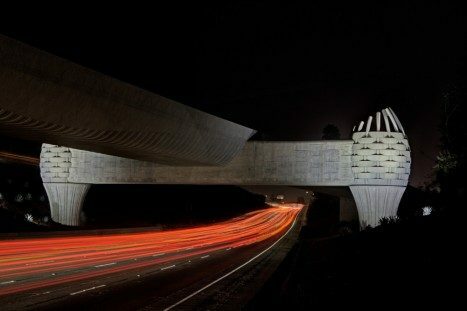 The superstructure’s serpentine main underbelly of the bridge contains casted grooves and hatch marks which simulate the patterns found on the Western Diamondback snake and metaphorically reference the connectivity of the transit system. 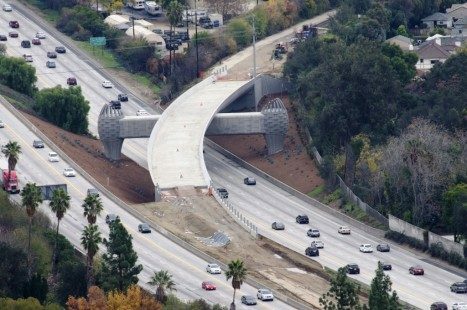 View the Gold Line Bridge image gallery (containing construction progress and completed bridge high-resolution images) as well as interviews and bios of some of the key staff members who made this structure a reality by visiting our Media Resources page. 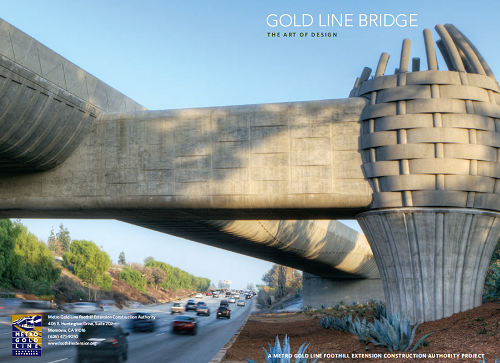 Click here to visit goldlinebridge, the official Facebook home of the Gold Line Bridge.